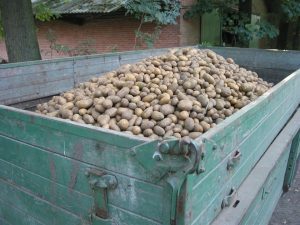 We’ve recently talked about a few different tactics for obtaining food when SHTF and today’s article is going to focus on the “potato tower” method. With this method, anyone can easily grow a lot of potatoes in about 4 square feet of space. This method can be used both indoors and outside, so you can build your potato tower in a backyard survival garden or use it as an indoor food source. 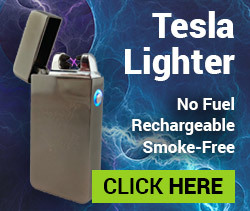 Best of all, the method is very simple and inexpensive to set up. 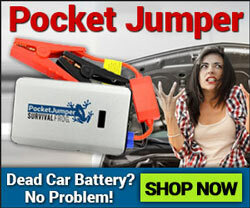 When SHTF, having a reliable source of food will be invaluable. 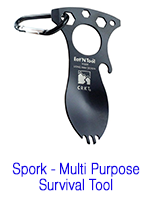 The best food supplies are those that can be easily maintained while providing food for the long-term. The potato tower method offers both of these benefits. In fact, this method makes growing potatoes so convenient that you may even decide to get started with it right away. Potatoes grow better in loose, loamy soil that allows air and water in to reach the roots of the vegetable. If the only soil you have on hand is heavy and clay-like, you can mix in some organic matter like leaves or hay to open up the soil. If your seed potatoes are on the larger side, cut them up before planting. Make sure each piece has at least two eyes in it. 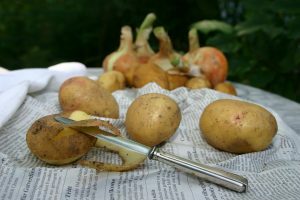 Most gardeners recommend covering the cut-up seed potatoes with fir dust. This seals the open ends and protects them from rot. 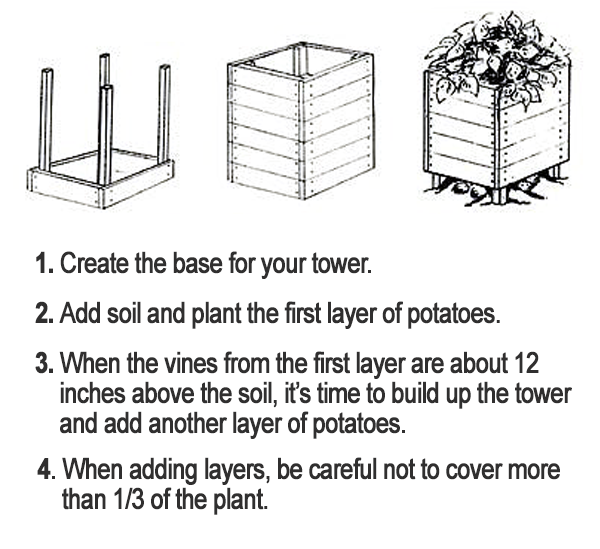 The above list will let you build a basic potato box, but other variations of the tower exist. Some people have stacked tires to make a tower. In the video below, you’ll see how one woman grew her potatoes using a tower made of chicken wire. The key to this method is to plant layer after layer of potatoes on top of each other and assemble your tower as you go along. When it’s time to harvest, you can either wait for the last layer of potatoes to mature and empty out the entire tower or grab spuds from the lower levels first. Just make sure you replace the boards and soil you have to move. What’s So Great About Potatoes? Potatoes are one of the best survival crops out there. Regardless of whether or not you use the tower method to grow them, they should be one of the vegetables in your survival garden. Potatoes are tough. They can tolerate poor soil conditions and varied climates, plus there are several potato varieties that are resistant to diseases. Potatoes are also calorie-dense, produce high yields, and don’t require much water to grow. Unfortunately, because of junk food like french fries and potato chips, many people assume that potatoes are unhealthy as well. The truth is, potatoes are a great source of both vitamin C and potassium. Potatoes have a high glycemic index which means that the carbs from eating one enter into your bloodstream fast and provide your body with energy. It sounds crazy, but some Ironman athletes have been known to snack on boiled potatoes to help them out during endurance events. We also have examples of people who’ve eaten nothing but potatoes for an extended period with no negative health effects. Now, I’m not recommending that anyone switch to an all-potato diet, but someone could find themselves with nothing else to eat when SHTF. Looking for more suggestions for your survival pantry? Check out this list of 15 Must-Have Survival Foods. You’ll likely have to store some of the potatoes you’ve grown using the tower method. Luckily, you can safely store potatoes a long time by using the following tips. First of all, it’s actually better if you don’t wash potatoes before storing them. You can brush off any dirt on the spud, but exposing potatoes to moisture makes them more vulnerable to rot. 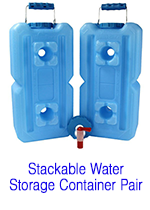 Furthermore, in a SHTF scenario, using clean water this way is largely a waste. You’ll also want to make sure your storage area is dry, dark, and free of debris. Whatever you do, do not freeze potatoes or store them in a refrigerator. Cold temperatures cause the starch inside a potato to turn into sugar more quickly. This has a negative effect on the flavor and texture by making the potato sweet and gritty. After your harvest, you will want to set aside at least a few potatoes to serve as seeds for the next grow cycle. 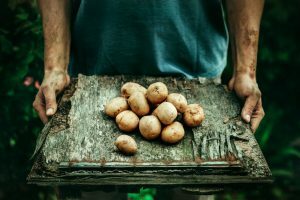 Unless you do plan on only eating potatoes, it’s probably a good idea to stock up on a few different survival foods. Survival Cave Canned Meats have a shelf-life of over 25 years and make a great addition to your food storage. 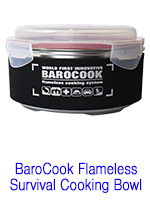 Click here or on the image below to view our full selection of Survival Cave Canned Meat. 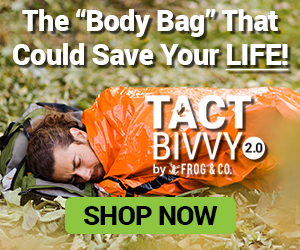 This entry was posted in DIY Projects, DIY Survival, Survival Cooking and tagged best survival foods, DIY, DIY Survival, food, food storage, gardening, survival food on March 9, 2017 by Survival Frog.